Hi. There wasn't an obvious place to post this, so it's going here, in part because I think it's probably related to NDA-covered sections of the forums. This is not AmpliFi nor Teleport, just these community forums. When looking at user profiles, I've noticed some really weird behavior for some users. I'm going to use @Thiago-Vinhas's profile as a prime example. When you navigate to the profile, it shows (as of now) 46 posts for his account. 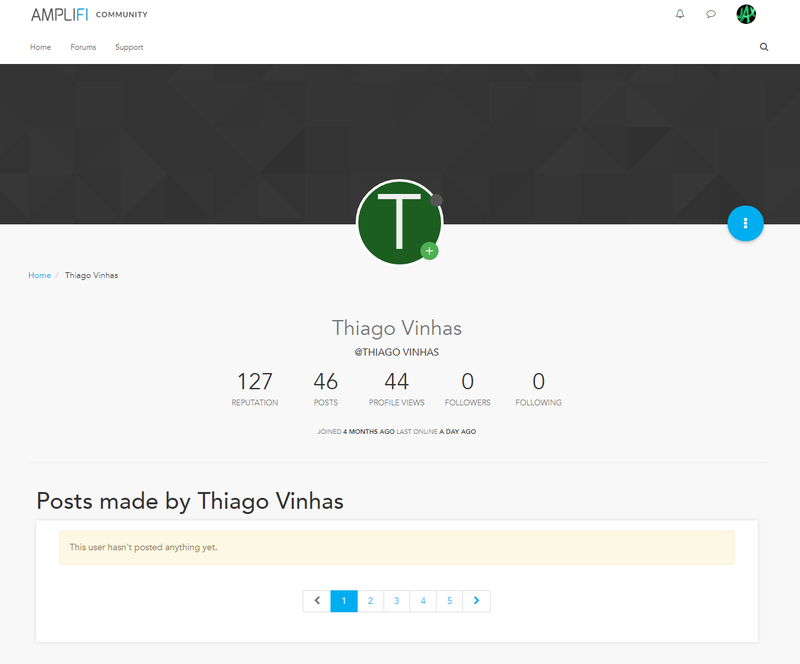 But below the top summary, the "Posts made by Thiago Vinhas" section states "This user hasn't posted anything yet.". However, that's just Page 1 of the results. When you go to Page 2, you then actually see posts for the user. What I suspect: All of the user's recent posts are in an NDA-covered section of the community forums that I don't currently have access to. And as such, those posts are filtered out for me but pagination of those results don't quite handle that filtered view. I get that this is probably a pretty low priority for Ubnt. I just wanted to make sure this made it in as a ticket/backlog item somewhere in case it wasn't already there. @shane-milton Pretty sure you're suspicions are correct... But what browser are you using? I have access to all of his posts but it doesn't paginate in Chrome, it just adds more as you scroll down. @shane-milton I'm thinking since you don't have access to his recent posts, it has nothing load so you're seeing the pagination on the bottom. Since I can see them, it loads the first page and then loads more as I scroll. When you look at your own profile does it do continuous scroll? @maj170123 Nope, my own profile has the manual pagination as well - no continuous scroll. @shane-milton Ah, go into your profile settings. There is an option for pagination to turn that off/on and set how many posts per page show. Yeah, you're right. All my posts were to NDA forums, that's why they don't show on the profile page. Now that @thiago-vinhas replied to this thread, I see as shown below. So I think this narrows down for Ubtn devs what the bug is pretty well. Given that it's NDA forum related, that's why I posted in this section (this is the only NDA section I have access to and I didn't want to post this more publicly than this). @UBNT-Brett - Can you make sure this bug report finds the appropriate person?